Most natural stones are porous, meaning they are like hard sponges that have the ability to absorb liquids. Natural stone is also sensitive and can become damaged easily by these liquids, leaving the stone vulnerable to outside influences. If you are interested in preserving the look of your natural stone for years to come, the best course of action is to seal your stone. Once your stone is sealed it will provide a barrier between it and foreign materials. Not only does sealing your stone protect is against outside influences, it also prevents premature discoloration of the stone as a result of wear and tear on the stone’s surface. It is important to note that natural stone does require more than one initial seal. Once it is installed, it will need to be sealed again periodically to maintain the barrier of protection. Whenever your natural stone is in a moist environment, such as, in a bathroom, it will be important to seal it more frequently. This is because the humidity and moisture of a bathroom will weaken the seal, leaving your stone unprotected. Additionally, having unsealed stone in a moist environment can lead to the water making its way into the porous stone, resulting in mold and mildew forming within the the stone. 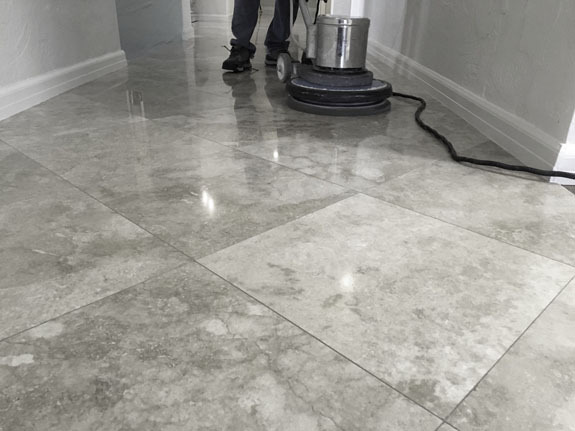 -Avoiding Moisture Damage: Whenever you seal your natural stone you will have a protective layer for spills to bead up on, instead of penetrating into. This helps avoid staining, mildew, and damage from acidic materials that have the potential to damage your stone. -Longevity Of The Stone: Natural stone has the ability to last for decades when treated properly. Part of this treatment is regularly sealing the surface of your stone. When you avoid moisture build up and harsh chemicals interacting with your stone, you are increasing the lifespan of your stone. -Stone Aesthetics: While the primary catalyst for sealing natural stone is to protect the stone from moisture, staining, and etching, this is not the only reason for it. Sealing natural stone also changes the appearance of the stone. The sealant adds a gorgeous, reflective sheen to the surface of the stone that is truly eye catching. How Often Should Your Natural Stone Be Sealed? If your natural stone is in a high traffic area, it should be sealed annually to avoid damage to the stone. Lower traffic areas can go longer spans of time, sometimes even up to three or four years. However, it should be taken into consideration that their are other outside variables that can impact the length of time a stone will need to be sealed. Some of these variables include high moisture environments, or environments with children or pets.